Lamb or goat is a must on Italian Easter lunch menus. Many of us do follow a religion – maybe not so much in a spiritual way, but in the way we stick to traditions when it comes to the food on the table. Preheat oven to 210C or 190C fan. Heat oil in a large frying pan on high. Cook lamb racks one at a time, turning, for 2-3 mins, until browned all over. Remove from heat and cool. Place pancetta in a food processor and process until a paste forms. Transfer to a bowl. Add garlic and thyme and mix well. Press mixture over upper side of lamb. Bake for 20 mins for medium-rare or until cooked to your liking. Cover loosely with foil and rest for 5 mins. Meanwhile, melt butter in a large frying pan on high heat. Add sultanas and cook for 1 min. Add spinach and cook for 2 mins, until wilted. Season well and stir through pine nuts. 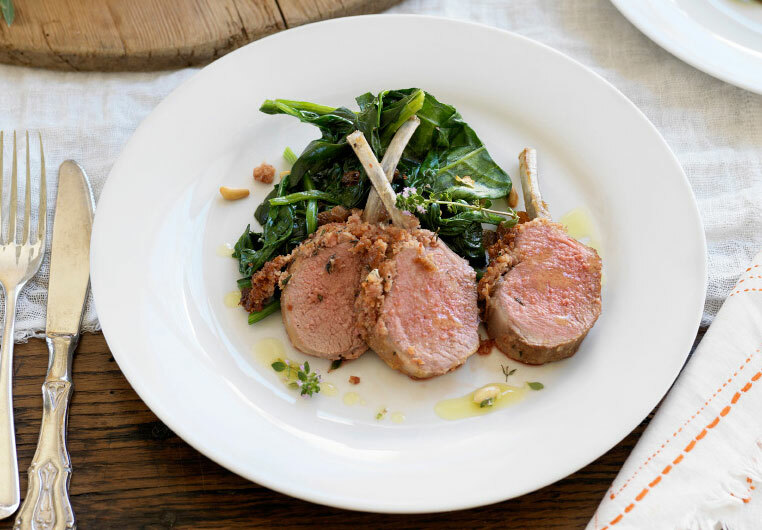 Carve lamb racks into cutlets and transfer to serving plates. 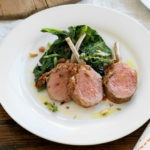 Drizzle over pan juices and serve with spinach, sultanas and pine nuts.